For thousands of years, traditional healers all over the world looked to the sea for healing remedies. Kelp was one key find. Kelp, is one of the richest sources of micro-nutrition, minerals and trace minerals. Kelp is especially high in Iodine and Potassium. 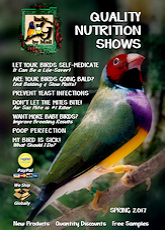 Iodine deficiency is a common problem in Australian birds especially Lady Gouldians. The Australian birds seem to need more iodine than other birds. 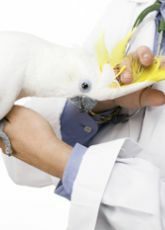 Deficiencies can result in breathing problems, difficulty in molting, poor breeding and feather condition. Liquid Iodine provides the additional iodine needed by the Gouldians. 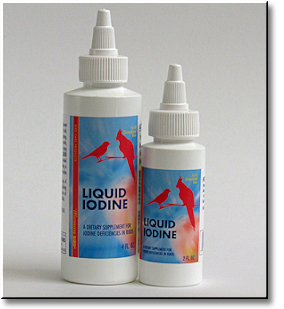 Liquid Iodine - provides the added iodine needed by Australian birds. Eliminates balding in Gouldians. Will improve feather condition and infertility problems. Stainless Steel Measuring Spoon Set- - 4 piece stainless steel with both American and Metric measures on the handle. Take the confusion out of converting to metric measure.